The Next Flag for the Next Egypt? With the events of 2-11 still echoing in hearts and minds (and streets and protests in other Arab countries,) the nation is turning to the business of rebuilding. And the world is taking notice of Egypt: citizens bound by ideology stage a massive and (mostly) peaceful demonstration of hundreds of thousands, then achieve their regime-change objectives, and then come back the next day to help clean the square and the streets where they demonstrated. That’s an example of singular aims and national pride, eh? But the next Egypt will also need rebranding. We’re all well aware of the nation-building tasks ahead: new government, new constitution, new systems and infrastructures, all leading to new elections this September. That’s plenty to chew on. But one thing I’m thinking of is the identity system: the Egyptian flag. What will IT become? And should it change? The white stripe symbolizes the peaceful nature of the revolution, when the monarchy was effectively abolished without bloodshed. The black stripe is a combined reminder: the end of oppression by Britain and by a Monarchy acting under same. 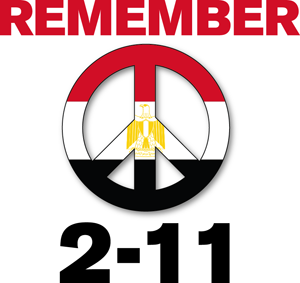 If the Red, White and Black are symbols and reminders of revolution against oppression, surely the 2-11-11 liberation of Egypt by peaceful demonstration deserves lasting representation. 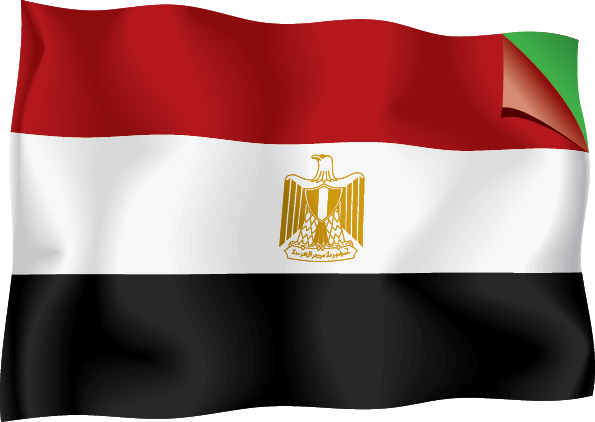 It will be quite interesting to watch not only what develops on the flag of Egypt, but how it becomes adopted. My guess is it will be a refreshingly democratic process at work. In the rendering above, I’ve shown a corner of the red stripe being pulled away and revealing a vibrant green. It could be that Egypt simply adopts a pan-Arab color, or perhaps it means something more: a verdant period ahead for a nation that is dutifully evolving by choice, and quietly leading by example. Egypt 2.0 Beta: Strategy outlines for the NEXT Egypt. 11 February will go down in history as a day to mark the beginning of the next Egypt. As I wrote in my previous post, this is the beta period for Egypt 2.0. With former President Mubarak (that sounds strange, doesn’t it?) en route to Sharm el Sheikh, the bonds of “emergency rule” have been broken after 30 years, and the Army is in control of the country’s affairs while a transition takes place. Today’s demonstration has been won with hugs and kisses, not stones and rockets. That much is encouraging. An absolutely jubilant and electrifying scene in Tahrir Square is wonderful to see and inspiring for the world to share. I can hardly catch my breath for the splendour of it all. However, there’s an important period to come. And this could be the most important six or seven months in recent human history. Will Egypt usher in a new era of peace and representative democracy, or will there be a subversive shift to non-secular leadership, in the form of the Muslim Brotherhood? Either route will have seismic effects on the world – economically, politically and culturally. Continuing our de facto marketing plan for Egypt, the next phase will demand strategies. And today’s events clearly demonstrate how quickly circumstances can change the needs and parameters of formulating strategies. Egypt has the opportunity to become the first modern Middle Eastern country to espouse a true democracy. In a “build the market” strategy, Egypt can lay out the blueprints for creating new channels of peace and prosperity, new methods for promotion and new areas of citizenry exploration. Pleasant side-effect #1: this astonishing moment could lead to other countries whose people are oppressed (either overtly or tacitly) doing the same and using the Egypt (read: peaceful) blueprint for regime transition. Pleasant side-effect #2: The entire process took roughly 18 days through mostly peaceful revolution – this itself is a model to be admired. Target a position on the world stage as a major player in global affairs. This means contributing to global causes as much as it means benefitting from them. Egypt is a logical and strategically desirable bridge between the West and East. This is a position no other country (Middle Eastern or otherwise) could feasibly occupy. For the citizens of the country, this competitive advantage could mean major benefits, particularly economic reforms and human rights reforms. Today, the Egyptian people have earned the right to benefit from everything life has to offer, no longer through a filter of heavy-handed government rule. Pleasant side-effect: competition is good. It could lead other countries to strive for equal representation, it could lead other countries to begin offering their core competencies for the benefit of global advance. Yummy. Become the modern example for tolerance and non-secular rule as a model for the rest of the middle East, and the world. We have seen all too often how unfair rule and ill-conceived revolution can gain airtime on the global stage. Think Rwanda, Darfur, the former Yugoslavia and so many others. This is an opportunity to take up a central cause, (collective emancipation?) commit to a central mission, rally support and effect real change for real people. Not the stuff the talking heads are spouting, but ACTUAL human rights, ACTUAL representation, ACTUAL opportunity. Wow. Could be the best strategy yet. Pleasant side-effect: with a visible cause strategy, Egypt can help change misperceptions around the world about all Arabs being lumped in a “them” category. Wouldn’t that be something? The next phase for Egypt will be a telling one. And if the country and its people are to actually realize movement in a forward direction, now must be the time to set intelligent objectives. Marketing Egypt will be a tall task, which is why defining clear objectives is so critical at an early stage. Let’s be clear: “regime change” is not an objective in and of itself. It’s certainly a goal, and the sum of hundreds of thousands of protestors, rocks, hand-written signs and a zillion tweets and Facebook posts. But a suite of objectives could help the process of democratic transformation take shape, and could provide a road map to the next chapter in Egypt’s storied history. So what kind of goals should Egypt be setting at this point? Obviously, there are innumerable logistical considerations. Operational objectives must outline what the desired outcomes will be for electoral systems, governmental systems, infrastructure systems, military stability. Chief among these, of course, are all the financial systems that must be monitored, maintained and scrubbed for security. These include tax codes, regulatory systems for Egypt’s stock market, the maintenance and sustenance of Egypt’s chief revenue producers: the Suez, agricultural exports and tourism. The culmination of these objectives would likely be outlined in an amended Egyptian Republic constitution. Of course, political goals are nearly as important as the operational objectives. Egypt currently maintains a high profile on the world stage, despite its warts. The next government will have to lay out a specific agenda for its political objectives. How it will represent itself at the United Nations. Where it will stand on the myriad issues that face the Middle East. How it will contribute to global efforts facing the environment. Where it will draw a line in the Saharan sand on women’s rights. And a host of others. Most marketing objectives I’ve helped formulate usually involve an element of productizing; helping my clients draw fact-based conclusions on what products will drive revenue, or drive new opportunities for engagement. For Egypt, the product plan will likely involve two phases: expanding its current line, and developing new products the world desires. Its current line of agrarian exports can be expanded. Cotton, rice, wheat and others are a very good start. But there are tens of millions of people who could be gainfully employed building equipment, or refining sugar, or planting new citrus crops near the Nile. And for that matter, new contributors to GDP are just waiting to emerge: there are equal numbers of engineers who could help build assembly plants; refineries, distribution centers, healthcare infrastructures and more. This may be the most exciting of all the objective-setting plans ahead for Egypt. Naturally, any entity that has been the focus of so much media coverage will have to undertake great effort to repair its image. The brand objectives will first be a combined effort of artfully bragging about the success of the aforementioned objectives coming to fruition: Yay – a new government! Yay – new GDP sources! Yay – equal representation under the law! But beyond that, Egypt will have to go a long way to lull back tourists to its resorts and attractions. Egypt will have to enact new programs to prove that it’s a safe and friendly place to visit. That it’s a worthwhile (and legit) country for investment. That it can stand up again and take the next step in the evolution of a great nation. The combination and consideration of these objectives will begin to form the vague shape of an Egypt of the future. But getting there will require sound strategies. Those in an upcoming post. Egypt could use some marketing right now. A dear colleague of mine just rang me up on the phone and said, “I’m interested in your take on Egypt.” He was asking because I am 100% Egyptian, although born and raised in America. We spoke for about 30 minutes, and I realized that there are many facets of what’s happening in Egypt that so many Americans (or others in the world) don’t know. So this will not be an entry about politics, or about history, or about civil disobedience, or a journalistic report about unfolding events. But it may espouse all of those disciplines and many others, since it will be about the marketing of what I believe is one of the greatest countries and one of the greatest peoples on earth. What’s happening in Egypt is at once breathtakingly fabulous and terrifyingly tenuous. A revolt is underfoot, fueled mostly by young citizens demanding change at the highest level – regime change. But what’s not seen is the potentiality of disaster in this, the most populous Middle Eastern country. While Egypt needs a complete marketing makeover, let’s begin where all good marketing begins – with data. Here now, a brief SWOT analysis for Egypt. Egypt has amazing strengths and strategic assets, both natural and man-made, including the Suez Canal, a thriving agricultural export, (ever pay a premium for Egyptian cotton?) globally appealing tourism and the mighty Nile, where most of the nearly 80 million residents gravitate to make their homes and their livings. Perhaps one of the most underestimated and underreported assets of the country is the strength, the resolve and the character of Egyptian people. A fun-loving, hospitable and intelligent bunch who bring high-level skills (like medicine, engineering, technology and arts,) to the free world. There are countless other assets that may be less apparent: Egypt’s contribution to the arts, medicine and mathematics in ancient times. A stable and thriving population in modern times that has led to the Middle East’s leading free media infrastructure, some of the most advanced communications networks in the region and a growing stock market. But there’s an underside, too. And the country’s weaknesses are evident. Egypt has grown rapidly, with a disproportionate distribution of wealth concentrated in Cairo and Alexandria. There is woeful poverty and a quiet but obvious acceptance of class distinctions. Take the Zabbaleen, a minority people in inner-city Cairo who basically pick up more than ¾ of the garbage in the capital city. Despite their historical presence (they’ve been living this way since about the 1930’s,) as an urban asset, they have been overlooked in recent years when Mubarak’s administration awarded hundreds of millions of dollars in contracts to Italian contractors to pick up Cairo’s trash. Guess what? The Zabbaleen are better at it. They have found ways to recycle and/or repurpose up to 80 percent of Egypt’s waste, when nine figures of government capital investment can only manage about 20-25%. And what of Mr. Mubarak’s NDP (National Democratic Party?) How is it that they’ve managed to stay in power for more than 30 years? Another major weakness in Egypt: the beloved dance of apathy and system-wide corruption. Interestingly, Mr. Mubarak’s “term,” which has been won with either unanimous referendums or lame turnout is due up this September. And there are threats, to be sure. Apathy is a lame foxhole companion, and with groups such as the Muslim Brotherhood lurking and operating underground, it may be easy to quickly and perhaps completely overtake a country which has remained an ally for the West and an example (despite taunts, teases and threats,) to the rest of the Middle East. Don’t forget, this type of subversion was seen recently, when Hezbollah came to a position of near-irrefutable power in Lebanon’s parliament in 2008. Economic factors also play a crucial role in the threats facing Egypt…those in poverty will do nearly anything to get out…including, in some cases, listening to anyone, or voting for anyone that promises change. Gulp. And for that matter, change itself may be the most threatening factor of all…despite Mr. Mubarak’s inefficiencies as the head of government, he has succeeded – wildly – as a head of state. He shows up. He calls back. He’s on a first name basis with Barack, Nicolas, David and Angela as well as Abdallah, Michel, Momar and Bashar. He has kept his word and held Egypt’s stance on some of the most important issues facing the world, not the least of which is the 1979 Peace Accord signed at Camp David between Egypt and Israel. He averts risk. He stays out of the “he said/he said” arguments that most of the Middle East entertains. He has enjoyed decades of military and economic aid from the United States. He has kept a strong and loyal military in top shape. He has also presided over the longest stretch of peace in Egypt’s modern history. So where does Egypt go from here? Where all sound marketing plans go: setting objectives. Without goals, without a direction, Egypt will continue to wander aimlessly through the long night of stagnation. If El Baradei can help set those goals, then perhaps he is a viable alternative. If he can’t (if I were a betting man, I’d say it’s someone else – a more Obamaian type,) then someone must. As with any marketing plan, without objectives you can succeed and still go nowhere. Standing still is no longer a viable strategy. If this recent movement has proven anything, it’s that Egypt must now embrace movement.